Top seed Mohamed ElShorbagy defeated World No.5 Ali Farag in the final of the 2017 Channel VAS Championships at St George’s Hill, PSA M100 tournament to avenge his loss to his fellow Egyptian in the title decider of last week’s U.S. Open Presented by Macquarie Investment Management. "He beat me last week, I beat him this week, so maybe it’s going to be his turn next week [in Qatar] but hopefully we’re not going to play again. I thought we played a great match, it was really clean and fair and I’m happy that I was part of that." Farag said: "Today, the difference is experience. There is a reason why Mohamed was World No.1 for 28 months. "He knows how to back up those long tournaments and he knows how to push in those crucial moments. The succession of matches finally got to me. "I’m not used to playing four or five matches in a row at the moment and backing it up the following week. But I’m looking forward to learning, that’s what I’m doing at the moment, and I’m excited to learn how to do this in the coming tournaments. He truly deserved it today." Egyptian duo Mohamed ElShorbagy and Ali Farag will lock horns in the final of the 2017 Channel VAS Championships at St George’s Hill after both players triumphed on semi-finals day in Weybridge to set up a repeat of last week’s U.S. Open Presented by Macquarie Investment Management title decider. Both players are in red-hot form and ElShorbagy, who lost out to Farag in Philadelphia, earned his place in the showpiece finale courtesy of a 3-0 victory against Indian qualifier Saurav Ghosal, which saw both players compete in a high-quality affair. Ghosal chased and harried the Egyptian at every turn but ElShorbagy’s relentless pace eventually caught up with the World No.26 and World No.3 ElShorbagy closed out the win by a 13-11, 11-8, 11-9 scoreline to make it three finals from three tournaments as his return to form during the 2017/18 season continues. "It’s funny because he came through qualifying and I was helping him through his second match of qualifying because we’re really good friends," said top seed ElShorbagy. “He’s very good for the game and he was playing high-quality squash from the first point to the last. I just kept pushing and I’m glad it went my way in the end. Farag also earned his place in a third successive final this season after he repelled a spirited fightback from Peruvian World No.15 Diego Elias. Farag captured his maiden World Series title last week in Philadelphia to add to his runner-up spot at the China Open in September and his fine form showed no signs of abating as he built up a two-game lead, despite needing treatment mid-way through the opening game after being caught on the nose by Elias’s racket. A determined Elias had the crowd behind him though and he launched a superb fightback, taking the third and fourth games to draw level. But Farag’s game management skills came to the fore as the match crept towards its conclusion, with the 25-year-old taking momentum away from Elias with some measured squash and he dropped just three points to bring an end to a thrilling 85-minute encounter. "It’s thanks to people like Mohamed [World No.13 and fellow Egyptian Abouelghar] that I won," admitted Farag, the number two seed. "He told me that I had the character, I had to keep pushing and that I wasn’t World No.5 for nothing. I had to give it a big push, thankfully I did and it worked. If I’d lost, I would have had no regrets, I’m just happy to be through. "Tins always happen against him [Elias] because he moves the ball around really well and he’s very smooth, I never know where I should put the ball. I had to be strong and hope that Diego hit it with his racket. Mohamed told me that in between the fourth and fifth games and it worked." The final of the 2017 Channel VAS Championships will take place tomorrow (October 22nd) at 17:15 (BST) at the St George’s Hill Lawn Tennis Club as ElShorbagy and Farag go head-to-head for the lion’s share of the $100k prize fund. All of the action will be shown live on SQUASHTV (rest of world) and Eurosport Player (Europe only). Defending champion Paul Coll and last year’s runner-up Tarek Momen bowed out of the 2017 edition of the Channel VAS Championships at St George’s Hill at the quarter-final stage after falling to World No.5 Ali Farag and World No.15 Diego Elias, respectively, in Weybridge. Last week saw Farag lift his maiden World Series title at the U.S. Open title but he sent out an ominous warning to the other players in Weybridge by saying that he feels that he is playing better now than he did in Philadelphia. "I think this is the best I’ve played all week, even compared to the U.S. Open," said the 25-year-old Harvard-graduate. "I was very pleased with the way I controlled the pace because if it gets out of hand against Paul then I would have no chance. I had it in my head before I got on court that I had to stay in front of him as much as possible. "He’s so good at getting to the ball so I was trying to hold as much as possible and mix the pace up. I think I did that quite well today, I even surprised myself, to be honest." Up next for Farag is an encounter with Elias after the 20-year-old from Lima came out on top of a topsy-turvy clash with World No.8 Momen by an 11-8, 4-11, 11-6, 4-11, 11-3 margin to reach his third PSA M100 semi-final. "I’m really happy with the win, Tarek is a great player and he’s eight in the world," said Elias. "It would mean a lot to me [to get to the final], I’ve been in three semi-finals at $100k tournaments and I always lose, so I want to do my best tomorrow and try to get to the final." Elsewhere, World No.3 Mohamed ElShorbagy eased past Colombia’s former World No.4 Miguel Angel Rodriguez to earn his place in the semi-finals. The number one seed was irrepressible throughout the match as he dominated proceedings and gave Rodriguez nothing to work with around the middle as a focused performance from the Bristol-based Egyptian saw him take it 11-2, 11-3, 11-8 in 32 minutes to move to within one win of a fourth successive PSA World Tour final. “When you are in the zone, like I was in the first two games, it’s very hard for a player to take you out of it,” said ElShorbagy. “I knew I was bound to lose focus at some point in the third but I was expecting that I would lose more focus than I actually did. And in the third, I was always comfortable, always a couple of points ahead. “When you finish a match like that, you have to control your emotions because you know that you are not going to play like that every day. Last time we played was in San Francisco a few weeks ago, it was on a traditional court, it was a completely different style of squash and he nearly pushed me to five games." Indian qualifier Saurav Ghosal awaits ElShorbagy in the semi-finals after he followed up an opening day win over ElShorbagy’s brother, Marwan, with a victory over Mohamed Abouelghar. The semi-finals of the Channel VAS Championships take place tomorrow (October 21st) and all of the fixtures will be shown live on SQUASHTV (rest of world) and Eurosport Player (Europe only). Egyptian World No.5 Ali Farag and New Zealand’s World No.10 Paul Coll will lock horns in the quarter-finals of the Channel VAS Championships at St George’s Hill after they claimed wins on the second day of main draw action at the PSA M100 tournament in Weybridge. Farag, fresh from his maiden World Series title at last week’s U.S. Open, took on tournament wildcard Charlie Lee in his first round fixture, with home favourite Lee leading for spells during all three games as a fearless showing from the 19-year-old saw him hit some fine winners as he wrong-footed Farag and moved him into different areas of the court. But Farag put his experience to good use and the number two seed went up through the gears towards the latter half of the games as he closed out an 11-7, 11-8, 11-7 victory to reach the last eight. "It’s never easy playing the wildcard because he’s a local hero here and he’s got all of the support behind him," said Farag. "To be through in three is good to save energy, I’ve got a tough one tomorrow and I’m looking forward to that. "We [Farag and Coll] just played a couple of weeks ago in Shanghai and I won in four, when we played at the ToC he beat me in four, so I’m sure it’s going to be a very tough match." Defending champion Coll claimed a straight games victory against Australia’s World No.16 Ryan Cuskelly to earn his place in the quarter-finals. 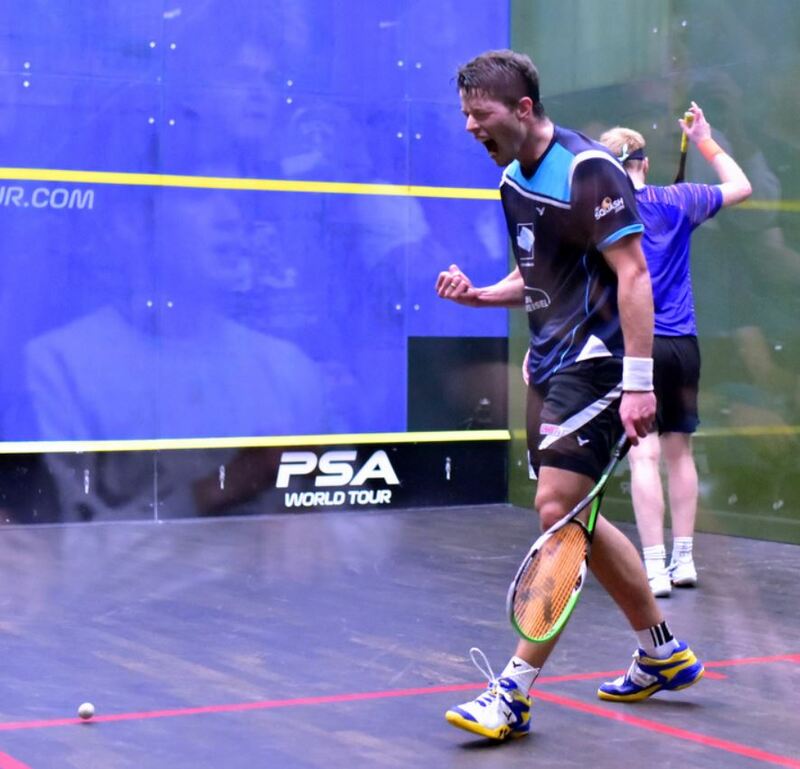 The number six seed hit his lines and kept Cuskelly away from the ’T’ throughout to take an 11-4, 11-5, 11-7 win. “Me and Ryan have played a few times, we seem to get each other quite a lot,” said Coll, who was returning to the scene of his biggest ever PSA World Tour title win. “I know his game and he’s a solid player, so I knew it was going to be a battle and I just tried to be even more solid. I really like the court and I’ve got good memories here, so I felt relaxed and just played my game, I felt really good out there." The man Coll beat in last year’s final - World No.8 Tarek Momen - is also through to the next round courtesy of a 3-1 victory over Australia’s World No.17 Cameron Pilley. Momen went a game down against Pilley but came back to take the next three games without reply. “Last year I was in the final, so I was always going to come back and try to go one step further and win the title,” said Momen. “He has had some big upsets against most of us in the top 10, so I was very cautious of that fact and I was trying to contain him as much as possible. 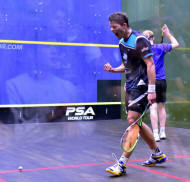 Momen will go head-to-head with Peru’s World No.15 Diego Elias after he defeated England’s Daryl Selby by a 3-0 margin. The Channel VAS Championships continue tomorrow (October 20th) with quarter-final action and all of the fixtures will be shown live on SQUASHTV (rest of world) and Eurosport Player (Europe only). Qualifiers Miguel Angel Rodriguez and Saurav Ghosal upset the seedings on day one of the Channel VAS Championships at St George’s Hill after they claimed respective wins over Egyptian duo Fares Dessouky and Marwan ElShorbagy to reach the quarter-finals of the PSA M100 tournament in Weybridge. Against World No.8 Dessouky, Rodriguez showed echoes of the form that took him as high as World No.4 two years ago as he hit consistent lines and retrieved well to claim his first win over a top 10 player since May 2016. The two players went head-to-head in a back-and-forth encounter as they both enjoyed spells of superiority in an engaging 80-minute spectacle. Dessouky fought back from 2-1 down to force a decider but World No.23 Rodriguez kept his head to prevail in the fifth game to seal an 8-11, 11-6, 11-7, 6-11, 11-5 victory. “I have won three matches in a row, last season I kept losing in the first round, so I’m happy with the performance and I think I played well,” said Rodriguez, who was competing in his 400th PSA World Tour match. “I found he got desperate because I felt he didn’t know what to do and had no solutions. I was in a rush to get the match finished too quickly, especially in the fourth, which he won after winning five rallies in a row. I was a bit mentally stronger than him today. Rodriguez will take on top seed Mohamed ElShorbagy after he overcame former World No.5 Borja Golan in three games, beating the Spaniard 15-13, 11-8, 11-4 to improve on last year’s first round exit. “I’m enjoying it more this year, I want to play this year,” said ElShorbagy. "Last year I went through a lot and I struggled a little bit mentally, but all the greatest athletes have bad phases in their careers. If I have that phase when I’m 25 or 26, when I’m still building my career, then I am lucky. I did a lot of things differently the summer in the way I approach my game and the way I approach life in general." ElShorbagy’s younger brother, Marwan, slumped to a first round exit after he lost out to India’s Ghosal by a 3-0 margin. Ghosal pounced on any loose shots from an out-of-sorts ElShorbagy as he raced around court and punished the Egyptian time and time again to claim an 11-7, 11-7, 11-2 triumph - his 200th win on the PSA World Tour. “He’s No.6 in the world right now and he’s had a really good 12-18 months and deserves to be where he is,” said World No.26 Ghosal. “Beating a player of his calibre is definitely a good win and it goes with when I beat [Simon] Rösner in Macau, which was also a good win for me. “All the wins against the top guys are important, they’re small steps towards realising what I want to achieve in my career, so I’m happy that I managed to win today against a quality opponent." Egyptian World No.18 Mohamed Abouelghar was the other victor on day one as he overcame Germany’s Raphael Kandra 3-1 and he will line up against Ghosal for a place in the semi-finals. First round action from the Channel VAS Championships continues tomorrow (October 19th) and all of the fixtures will be shown live on SQUASHTV (rest of world) and Eurosport Player (Europe only). Germany’s World No.42 Raphael Kandra upset local favourite Tom Richards in straight games to earn his place in the main draw of the 2017 Channel VAS Championships at St George’s Hill, PSA M100 tournament on a disappointing night for English players in Weybridge. The 26-year-old from Paderborn narrowly overcame World No.35 Richards in an opening game tie-break before moving on to claim victories in games two and three to wrap up a 12-10, 11-6, 11-9 triumph in 40 minutes. "Sometimes you register for a tournament and wonder if the timing is right," said Kandra. "You don’t expect too much out of it and the result comes. I’m quite proud of this one." Kandra will line up against World No.13 Mohamed Abouelghar when the main draw gets under way tomorrow (October 18) as he looks to improve on the first round defeat he suffered at this tournament on his last appearance in Weybridge in 2015. He will be joined in the main draw by Australia’s World No.17 Cameron Pilley. 34-year-old Pilley was appearing in the qualifying rounds of a PSA World Tour event for the first time since 2006 and he dropped just one game en route to the main draw after following up a 3-0 win over Lance Beddoes with a 3-1 victory over England’s Adrian Waller. Up next for Pilley is a clash with last year’s runner-up Tarek Momen in the first round of the main draw, while former World No.4 Miguel Angel Rodriguez and Indian World No.26 Saurav Ghosal are also through to the main draw courtesy of respective wins over 2015 winner Chris Simpson and World No.40 Declan James - ensuring that there were no wins for the English contingent on the final day of qualifying. Rodriguez, a quarter-finalist at last year’s tournament, will lock horns with World No.9 Fares Dessouky, with Ghosal coming up against World No.6 Marwan ElShorbagy in round one. The main draw of the Channel VAS Championships will be held between October 18-22 and the whole tournament will take place at the St George's Hill Lawn Tennis Club. Every match from the main draw will be shown live on SQUASHTV (Rest of World) or Eurosport Player (Europe only). 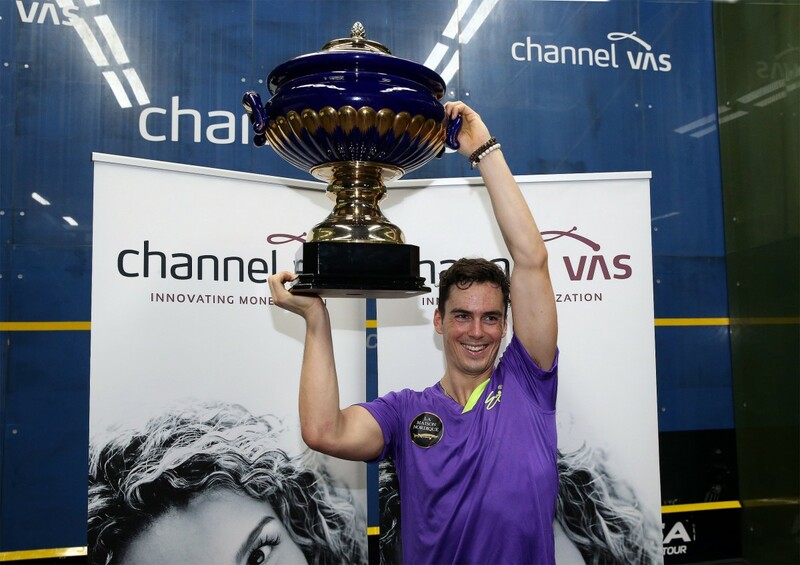 New Zealand’s World No.10 Paul Coll will return to the scene of his biggest ever title win on the PSA World Tour between October 18-22 when he lines up at the 2017 Channel VAS Championships at St George’s Hill in Weybridge, England. The 25-year-old from Greymouth had a breakthrough 2016/17 season, with his title win at the 2016 Channel VAS Championships last December seeing him fight all the way from qualifying to take the title, with the then World No.33 beating higher ranked players such as Max Lee, Miguel Angel Rodriguez, Daryl Selby and Tarek Momen en route to his maiden PSA M100 tournament victory. Last month saw Coll become the first male New Zealander since Ross Norman in 1995 to reach the top 10 and he admits that last year’s title win in Weybridge was crucial in his development from a talented up-and-comer to one of the elite players on the PSA World Tour. "I have some really good memories from last year," said Coll. "I’m looking forward to going back, it’s a very good tournament to play in and it’s a nice club. After starting the season with a semi-final berth at the J.P. Morgan China Squash Open, Coll claimed another landmark victory in the first round of the U.S. Open Presented by Macquarie Investment Management, beating World Champion and World No.2 Karim Abdel Gawad - the first time Coll had ever beaten a player ranked inside the world’s top five. The Kiwi was ultimately unable to back up that win as he slumped to a disappointing defeat to Egypt’s Omar Mosaad in the second round, but he says that he is relishing the chance to bounce back in Weybridge. "I’m happy with the way my game is going and I had a good win against Karim," Coll said. "There are two ways you can take a loss, it was a painful and very disappointing loss but I’m pretty hungry to do better next time and not make the same mistakes as I made in that match [against Mosaad]. "I sat down the next day and analysed what went wrong. I’m passed that match and I’m looking forward to the next match already." Coll will take on Austalia’s Ryan Cuskelly in round one of the Channel VAS Championships and is seeded to meet World No.5 Ali Farag in a mouthwatering quarter-final clash. The Channel VAS Championships also features the likes of Egyptian trio Mohamed ElShorbagy, his brother Marwan, and last year’s runner-up Momen. The qualifying rounds for the Channel VAS Championships at St George’s Hill will take place between October 16-17, with the main draw held between October 18-22. The whole tournament will take place at the St George's Hill Lawn Tennis Club. Egyptian duo Mohamed ElShorbagy and Ali Farag have been seeded to go head-to-head in the final of the 2017 Channel VAS Championships at St George’s Hill after the draw for the PSA M100 tournament was released today (September 19). World No.3 and top seed ElShorbagy will look to improve on a shock first round defeat at last year’s tournament as he takes on Spain’s former World No.16 Borja Golan for a place in the last eight. A win for the Egyptian powerhouse could see him face compatriot Fares Dessouky, while he is seeded to meet younger brother Marwan in a titanic semi-final encounter. The other side of the draw sees Farag take on tournament wildcard Joe Lee in round one, while the World No.5 is seeded to meet defending champion Paul Coll in a mouthwatering quarter-final clash if the Kiwi World No.10 can come through against Australia's Ryan Cuskelly in what looks set to be the pick of the first round matches. Coll and Cuskelly are set to meet for the sixth time on the PSA World Tour, with Cuskelly currently leading the head-to-head record by four wins to one. It was the man from New Zealand who prevailed in their last meeting at the 2016 Delaware Investments U.S. Open, however, so it's all to play for in Weybridge. Elsewhere in the draw, 2016 runner-up Tarek Momen faces a qualifier in round one and a win would see him take on either England’s Daryl Selby or Peru’s World No.17 Diego Elias for a place in the semi-finals - with the former getting the better of Mohamed ElShorbagy on the opening day of last year’s tournament. Qualification for the Channel VAS Championships at St George’s Hill will take place between October 16-17, with the main draw held between October 18-22. The whole tournament will take place at the St George's Hill Lawn Tennis Club. Every match from the main draw will also be shown live on SQUASHTV (Rest of World) or Eurosport Player (Europe only).